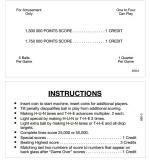 Score and instruction card set (4) for Game Plan ANDROMEDA pinball. Playfield apron score / instruction cards (5) for Game Plan SHARPSHOOTER. Lower playfield apron score cards (5) for Game Plan SUPER NOVA. Lower playfield apron score cards (2) for Game Plan LADY SHARPSHOOTER. Score/ instruction card for Game Plan FAMILY FUN pinball machine. Lower playfield apron score card for Game Plan CAMEL LIGHTS. Lower playfield apron score cards (5) for Game Plan CONEY ISLAND pinball machine.